This set consists of HEAT SHIELD Tongs and Sider Flipper. Grill Daddy heat shield barbecue tools shield your hands from grill heat and splatter. Ergonomically designed handle with heat shields swivel with your hand for continuous protection. Even while handling food on the grill, the heat shield freely rotates to keep protecting your hand from the grill's heat. Detachable heads means you can mix and match attachments. Grill Daddy's Heat Shield collection for safe, easy grilling (pieces sold separately). Made by Grill Daddy--makers of the revolutionary steam-cleaning grill brushes--Heat Shield BBQ tools offer a host of ingenious deluxe features to add safety, comfort, and amazing control when grilling. Made with professional-grade, high quality stainless steel, Grill Daddy's Heat Shield with Tong offers you sure grip, great control, easy storage and added safety. The tongs are equipped with rotating, patented hand guard to protect your hands from searing heat, food splatters and flare-ups. The comfortable hand guard rotates to shield your hand no matter how you turn it. 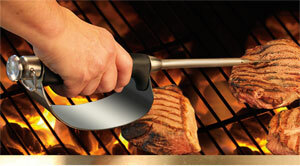 The self-locking tongs feature flared jaws to provide unparalleled control and grip even when working with heavy meats. The handle neatly stores away a meat thermometer for handy access. The telescoping shaft can be extended when needed and retracted for easy storage. Mix and match the Heat Shield with five different attachments and tools such as the spatula, fork, basting brush, slider flipper and fish flipper so you can get the comfort and safety you need with all your grilling tasks. The tong is also easy to clean as well as store. Like a fine automobile, each Heat Shield tool is a masterpiece in design, providing incomparable handling and grilling comfort. 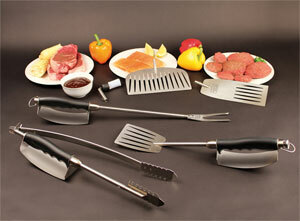 Ergonomic comfort-grip handles are weighted and balanced for effortless grilling without fatigue. 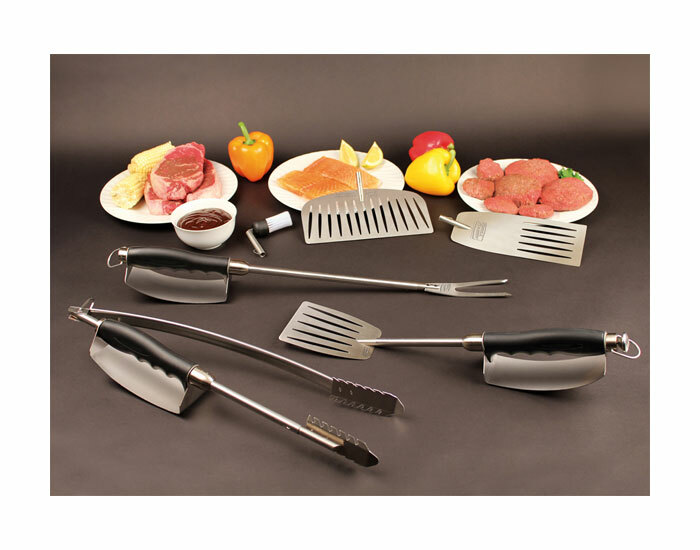 The Heat Shield line includes three tools (multi-purpose fork, over-sized spatula, sure-grip grilling tongs) and five specialty attachments (fish flipper, slider flipper, silicone basting brush, fork, spatula). Mix and match tools and attachments for all grilling tasks. Rotating hand guard protects your hand from getting burned by the heat. Cook with Cool ConfidenceAs part of Grill Daddy's Heat Shield collection, the professional-grade tongs have the perfect fit and feel with just the right spring-action. Flared teeth on the tongs' jaws handle extra-thick cuts of meat with ease. 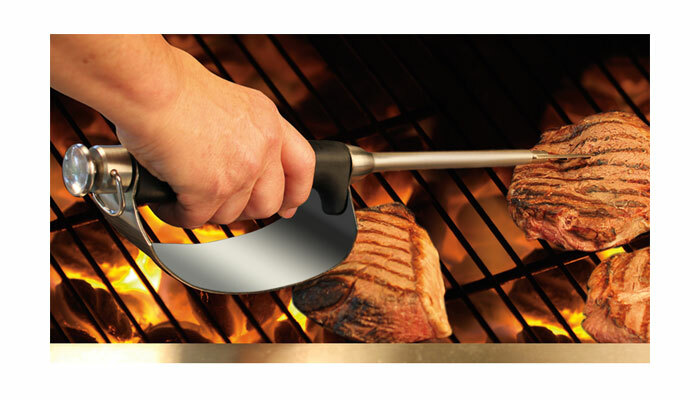 With a push of a button, replace a tongs jaw with a spatula for precise grab-and-hold action. It's like a whole new tool--perfect for hot dogs, sausages, burgers, and fish. Built to last from professional-grade stainless-steel, the tool is equipped with Grill Daddy's patented rotating hand guard. So no matter how you turn it, your hands will stay cool, comfortable, and safe as the heat shield's swivel-action maintains continuous protection from flare-ups, searing grill heat, and burning hot food splatters. Each of the Heat Shield specialty attachments are crafted from professional-grade stainless steel. Change attachments with the push of a button. Then slide the attachment off and slip your new choice in place. It's just that simple. With extra-long tines set at just the right angle, you'll handle thick chops and steaks like a BBQ pro. It's just the right thickness and heat-treated to prevent bending. Special heat-resistant silicone bristles allow you to baste to tasty perfection even on big hot grills. Set in a perfect right-angle, the brush is designed to effortlessly baste from bowl to hot grill. It comes with dishwasher-safe removable bristles. 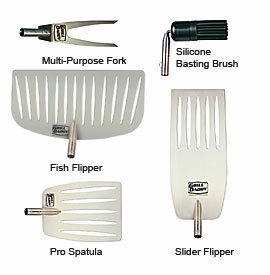 Use Grill Daddy's specially designed fish flipper to cook big delicate fish fillets to perfection. At 9-1/2 inches wide, you won't want to grill fish without it. Flip three party-size burgers at once with the super slider flipper. A full 9 inches long for maximum grilling efficiency. Cook mouthwatering burgers that look amazing with this professional-grade spatula. It's perfect for precision flipping and handling. U.S. and international patents pending.